From space and Earth-based observations so far, we know that the Martian atmosphere is about one hundred times less dense than the Earth's at ground level, that it's composed almost entirely of carbon dioxide (CO2) with trace to small amounts of other gases, and that atmospheric temperatures range from 298 K (+25°C) at the equator to 140 K (-130° C) at the winter pole. We also know that the atmosphere contains a lot of dust. MGS image of dust over Valles Marineris. But there are many gaps in our knowledge. We still don't know, for example, how temperature and pressure vary with altitude, what the global circulation patterns are, how the composition of the atmosphere varies with time and place, and what all the trace constituents are. We also don't know for sure how much dust there is in the atmosphere, how it's transported there, what it's made of and how it affects the Martian weather. The Planetary Fourier Spectrometer (PFS) on board Mars Express will help find the answers to some of these outstanding questions. The principle behind PFS is similar to that behind OMEGA: both instruments will identify complex molecules from the wavelengths the molecules absorb from sunlight and from the infrared radiation (heat) they emit. PFS, however, will take measurements over a wider wavelength range (1.2-45 µm) than OMEGA, which makes it best suited for identifying molecules in the atmosphere. "The two instruments are complementary," says Vittorio Formisano from IFSI, Frascati, Italy who is Principal Investigator for PFS. "OMEGA has better spatial resolution, which makes it good for imaging the composition of the surface, but PFS has better spectral resolution which gives it the precision necessary to identify gases in the atmosphere." PFS consists of four units: an interferometer with electronics, a control unit, a power supply and a pointing device. The total package weighs 31.4 kg. Light entering the interferometer is split according to wavelength and sent in one of two directions: short wavelengths (1.2-5 µm) towards a PbSe detector that must be kept cool (200-220 K) to increase the signal to noise ratio; and long wavelengths (5-45 µm) towards a detector whose temperature must be kept cool so that it can measure the temperature difference between itself and the light source. PFS will be capable of distinguishing 8000 spectral points in the short wavelength range and 2000 in the long. The instrument will work best when Mars Express is near pericentre, the point in each orbit when the spacecraft is closest to the planet. Measurements will be taken with the instrument pointing directly at the centre of the planet (nadir pointing). About 500-600 measurements will be recorded each orbit, during the three hours around pericentre when the spacecraft is at an altitude of less than 4000 km. As this will generate too much data to send directly back to Earth, some data analysis will be done on board. In particular, a fast Fourier transform (FFT) will be performed, hence the instrument's name. The FFT will effectively discard some of the superfluous data, retaining only that which contains useful spectral information. During the lifetime of Mars Express, many spectra will be recorded over the whole planet. By taking the average of as many spectra as possible, signals revealing the presence of even very minor constituents should show up. "We hope to get many, many measurements so that by averaging thousands of spectra, we increase the signal to noise ratio tremendously," says Formisano. "Then we'll be able to see minor species. If we're really able to get a million spectra, as I hope, we will be able to have many local averages and then we'll be able to study the longitudinal variation of all these minor species," he adds. 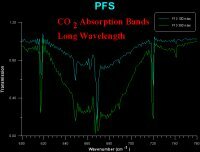 Absorption spectra taken with PFS in the laboratory showing the main carbon dioxide absorption bands (660 wavenumber ~15 µm). PFS's bread and butter studies, though, will centre on the 15 µm waveband, which is strongly absorbed by carbon dioxide. The instrument will perform a complex mathematical procedure on spectra at this wavelength to obtain the vertical temperature-pressure profile of the gas. As carbon dioxide makes up more than 98% of the Martian atmosphere, this measurement will form the basis of global atmospheric temperature and pressure studies. "If we have a million profiles of pressure and temperature, we will be able to compute the wind in three dimensions," says Formisano. "We will be able to produce our own map of global circulation. I hope to have a 3D map of the atmosphere for each of the eight Martian seasons during which Mars Express will be operating." Such information should be of use to teams that are building up global circulation models of the Martian atmosphere. 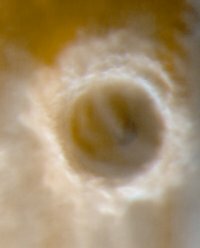 Image of a large impact crater showing ice and clouds taken with the camera on NASA's Mars Global Surveyor. PFS will also record spectra of the dust in the atmosphere. These will reveal the dust composition and also allow the obscuring effects of dust to be extracted from spectra of minor constituents, the most important of which are likely to be water, carbon monoxide (CO), methane (CH4) and formaldehyde (HCHO). The winter poles could be good places to search for these molecules. "In the winter, the temperature over the poles is so low that carbon dioxide becomes solid, causing a depletion of the gas in the atmosphere. But if there's a depletion in one gas, there must be an enrichment in others that do not condense at low temperatures," says Formisano. Formaldehyde, in particular, is expected to show up at the poles rather than elsewhere. "When you've got water and carbon dioxide ice and you bombard them with energetic particles (which stream into the poles from the solar wind), you can easily generate complex organic molecules such as formaldehyde," says Formisano. Formaldehyde has already been observed at the Martian poles from Earth-based telescopes. One of the most interesting molecules to search for, though, will be methane. "Methane can exist within certain low limits without any organic chemistry. But if you have a 'lot' of methane, there must be a source for it because methane is easily oxidised and destroyed. That source could be life," says Formisano. Principal Investigator: Dr. Vittorio Formisano, Instituto Fisica Spazio Interplanetario, Rome, Italy.